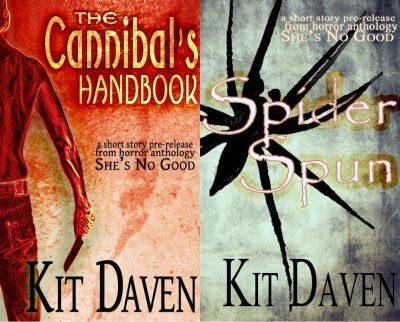 2015’s “Spider Spun” and “The Cannibal’s Handbook” are two short stories by Kitchener-Waterloo author Kit Daven. I bought them because they were only 99 cents (less than a coffee and a doughnut) and because for some reason (even though the word counts are clearly indicated) I thought they were novellas. Both are from the upcoming collection, She’s No Good (upcoming, but no release date given). The Storms killed the plants and with them every animal dependent on plants and every animal dependent on those animals, which caused a mass extinction of a scale not seen for sixty-five million years. Only one widely distributed species remained, Homo sapiens, and only one easily found foodstuff remained, also Homo sapiens. The old lady has an edge over her cannibal foes. She can work magic. Well, two edges: she knows the secret cost of cannibalism. But even she cannot foresee how that price could be turned to advantage. To reassure readers who know how ecologies work: not quite all the plants were killed and the remnant is making a big comeback. Humanity just might survive the die-off if the population doesn’t crash too low … and if any of the human survivors are still willing to let another human get within arm’s reach. There’s some reason for optimism on the second point, because the old lady spends the story trying to rescue two kids who have been captured by a wiindigoo (sic), with an eye to rehabilitating the kids if it is still possible. It’s not (quite) a war of all against all until the last cannibal starves to death. Which is not to say the old lady is entirely nice or that she is not suspiciously well-informed about wiindigoo. Izzy’s war with the spiders infesting her home could have been a welcome distraction from Izzy’s paranoid conviction that her husband and best friend are having a not-so-secret affair. Alas for Izzy, the spider, like her obsession, can only grow with time. One lesson here is to know when to cut one’s losses. Once Izzy is convinced that her husband is unfaithful (and disrespectful of her) and that her supposed best friend is sleeping with him, the sensible reaction is to just walk away. Even if it weren’t clear that her rage was somehow feeding the spiders, an open break is the sensible option. This is a supernatural story so there’s no point to wondering what else the giant spiders were eating. And yet, I wonder. I am going to guess that She’s No Good is going to be a horror or weird fantasy collection. Both stories feature protagonists who have some sympathetic aspects, just enough to keep the reader interested — the old lady is trying to rescue two kids! Izzy is actually the wronged party she thinks she is; she is not simply paranoid! — but both stories are also rather, ah, disturbing. Hmmm. Make that almost certainly a horror collection. “The Cannibal’s Handbook” is available here (Amazon) and here (Smashwords). “Spider Spun” is available here (Amazon) and here (Smashwords). Please address corrections to jdnicoll at panix dot com.